The Caravan of Hope started in Lavasan, a village in the al Borz Mountains, north-west of Tehran, where the camels had lived for the past four years. The first few days were spent winding through the valleys of the foothills of the al Borz until the plains south of Tehran had been reached. The route then veered eastwards to pass through a nature reserve on the east side of the “Dereacheh-Namak”, a salt lake. On the other side of the lake the domes of the holy city of Qom could be seen glistening in the sun. Once past the salt lake we turned to the west along the northern fringes of the “Dasht-e-Kevir” the large salt desert of central Iran. We returned to civilization at the Imamzadeh Ali-abbas, a shrine to a holy man buried there long ago. The journey continued southwards along the fringes of the farm land near Kashan until we reached the city of Nain. Just to the south of that city, famous for it carpet-making, is the old caravanserai of Bafaraan, where we stayed for two weeks. The Iranian police had stopped us and did not allow us to continue further south as there was a danger of kidnapping by smugglers running drugs from Afghanistan. There was no other solution than to load the camels on the back of the logistics truck and to drive the remaining part of Iran, via Yazd, Rafsanjan, Shahr Babak, and Sirjan to Bandar Abbas. There we loaded the truck, with the camels on board, onto a landing craft which took us to the other side of the Persian Gulf, to Ras al Khaimah. The camels were unloaded at the village of Saadi, where Lilianne was the guest of the Khawathir tribe. She stayed there during the holy month of Ramadhan, to continue her journey during the first days of Eid al Fitr. The walk went from Saadi, via Falaj al Mualla, south of Sharjah, to Nad al Sheba near Dubai. 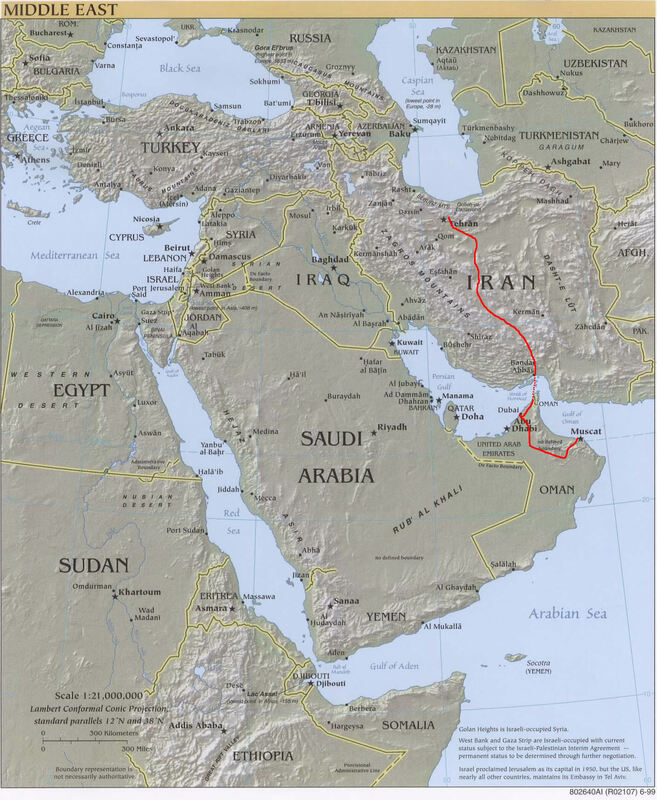 From there the route veered southwards via al Ain to al Wagan on the Omani border. After crossing the border the caravan walked past Ibri, Bahla and Nizwa on the way to Izz. After a few days rest at the home of Lilianne’s adoptive family, the journey continued via the ‘Sumail Gap’ to Seeb on the coast of the Gulf of Oman. Finally the way back to Dubai retraced the footsteps in the sand all the way back to Nad al Sheba in Dubai. All Content Copyright © 2005 by Lilianne Donders. All Rights Reserved.